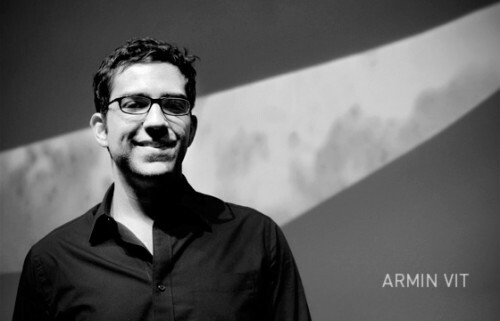 Thee Blog has a great interview this week with designer Armin Vit. I can’t remember exactly when I started following Armin’s work, but I do remember that the first day I’d heard of him, he was already prolific and influential. By 6:30 am I have to finish the Brand New post of the day. At 7:00 am the kids wake up. Me or Bryony take them to school. Come back and work through 12:30. Break for lunch. Come back to the desk at 1:00 and work through to 5:30 with kid interruptions. At 5:30 it’s time for dinner, bath time with the kids, story time. At 8:30 I’m usually back at my computer to answer e-mails and do Quipsologies. By 10:00 or 10:30 I collapse. Up at 5am? Already got in two hours of work and a five mile run by 8:30? Now that’s dedication. Be sure to read the rest and learn all about exactly what’s possible with the right combination of talent and discipline. If you’ve not heard of Armin before, take the rest of the afternoon to browse through some of his dozens of projects. Tell your boss I said it was ok.